I lost 16 pounds, feel hydrated, and have improved elimination. I ate ice throughout the fast, so that never quite went away! Not sure how much ice, maybe a couple of dozen cubes or so every day. It’s Saturday! Just completed my longest juice fast to date (3 weeks). I definitely wanted to end it on the weekend, even noting “Break Fast” on my calendar for this day. = ) This way, I have plenty of time to prepare and eat the food and just relax. From previous experience, although for shorter fasts, I know it’s important how I get back into food. To just dive back into eating cooked foods caused a lot of pain (and probably some damage inside) in the past. So, I literally wrote out a “Post-Juice Fast Plan” for the first three days and planned a shopping list to cover the meals. For the shopping list, I wrote how much of each ingredient would be needed for each meal, noting any substitutions or omitting ingredients I don’t like, then added it all up on one master shopping list. Even though the list is for 3 days of meals, I definitely expect it to last at least a week! 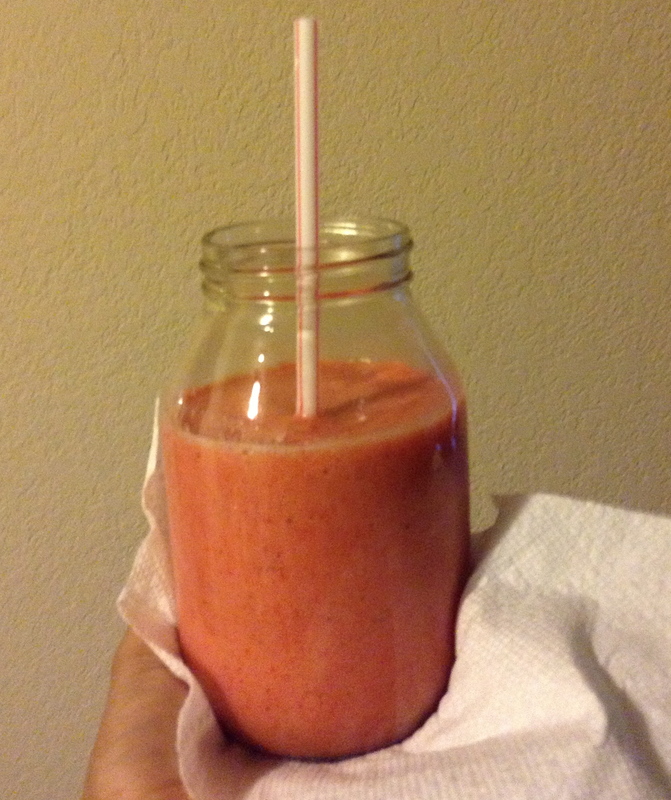 My first meal for today is about a quart of my favorite smoothie — strawberry and pineapple. A smoothie is just a step up from juice, as far as roughage. It is easy on the stomach. 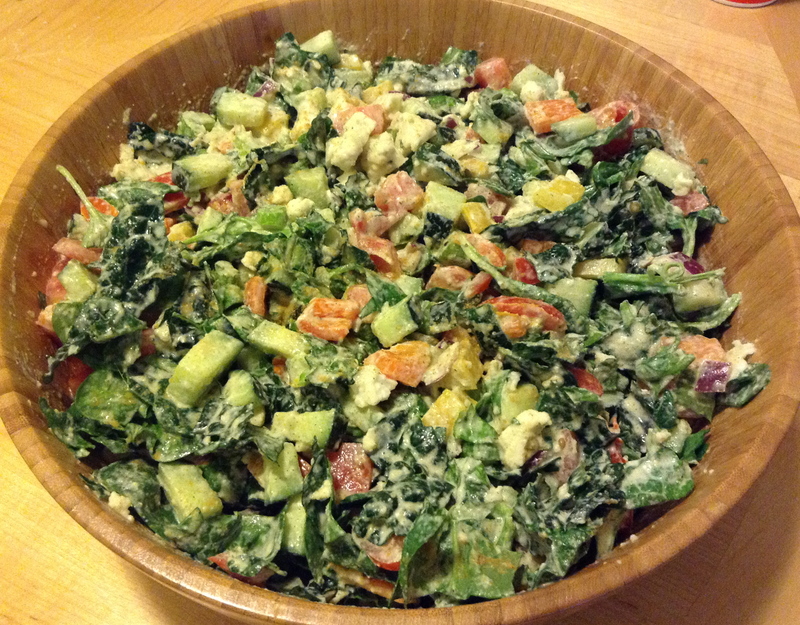 My lunch was a fraction of this massive, delicious Mediterranean salad by FullyRaw Kristina. I love it because it is low-fat, raw vegan (LFRV). Keeping foods light on the first day, plus I’m not that hungry. I dehydrated the rest of it for later. 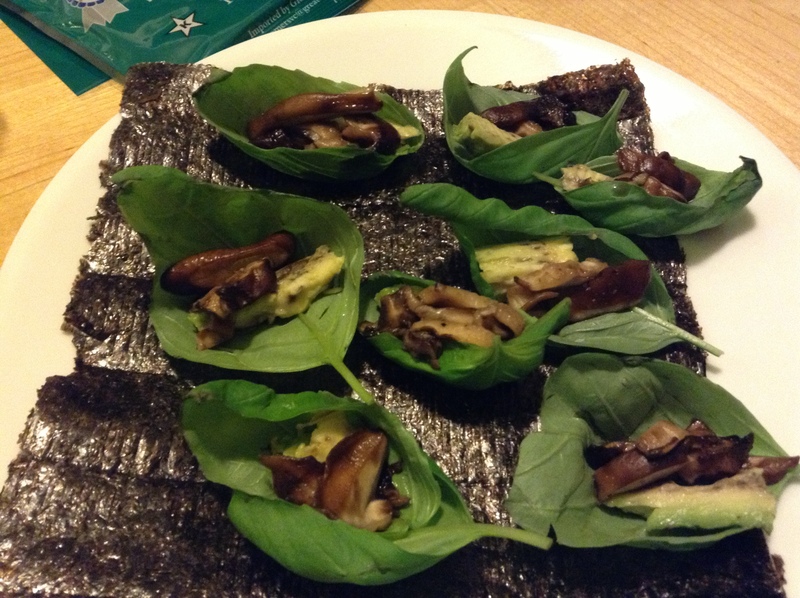 For dinner, I had Bragg’s-marinated mushrooms and avocado on basil, with a couple of sheets of nori seaweed. For Sunday, I planned to have chia seed oatmeal for breakfast, a raw veggie burger for lunch, and fruit & salad for dinner. I had a taste for something else though. Plus, I wanted to keep prep minimal. 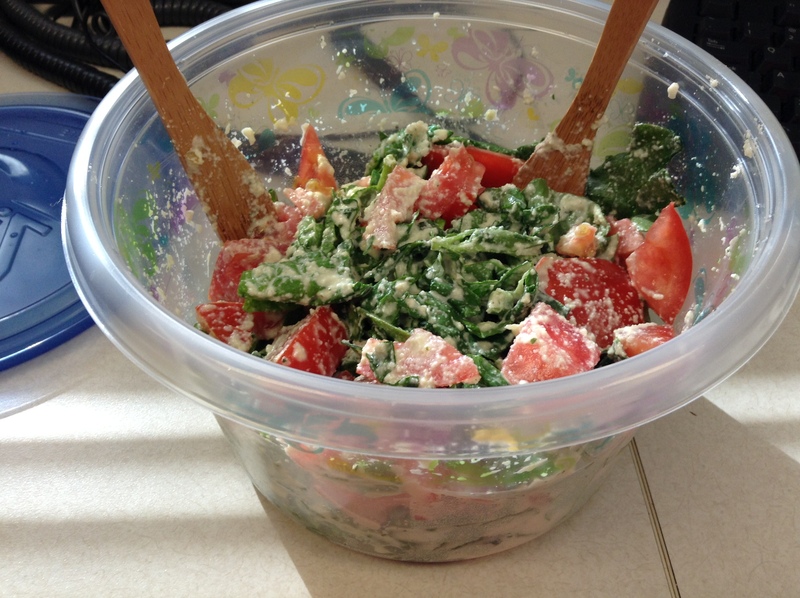 I kept it simple with coconut milk, a spinach salad, and a bowl of fruit. Works for me! Due to the planning and shopping, I have a well-stocked raw fridge, even though I didn’t make everything I planned. It’s Monday. Back to work. I’m quite nervous about staying raw while at work. It was much easier on the juice fast. Now, I worry I won’t pack enough…that I’ll be hungry…or that I won’t have a taste for what I packed. 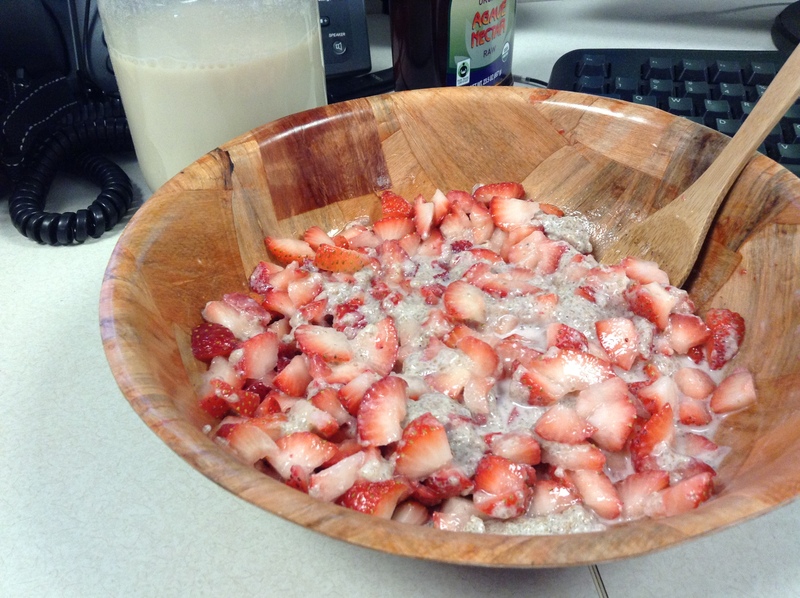 I made chia seed oatmeal for breakfast and a creamy spinach salad for lunch. I went back to cooked on Wednesday. I had one cooked meal after eating a bowl of fruit first. To my surprise, I didn’t double over in pain, which I was expecting from previous forays back to cooked. Then I realized the transition back to solid foods was successful this time. It’s not supposed to hurt! Overall, I was very satisfied with the long juice fast and the results. It was another experiment that was full of fun, simplicity, and inspiration.